Onomatopoeia is the formation of a word from a sound associated with what is named. For example, onomatopoeia is the hum of the bees, the pop of a balloon, or the tweet of a bird. The word Onomatopoeia can also be used to describe the use of such words for rhetorical effect. For example, in the sentence 'The poet Tennyson used onomatopoeia as a linguistic device' (see an example of Tennyson using onomatopoeia below). The adjective onomatopoeic is used in the sentence: "Woof is an example of an onomatopoeic word." The adverb onomatopoeically is used in the sentence: "She lived her life onomatopoeically ...whoopy!" 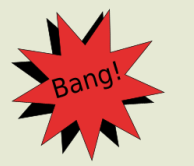 Onomatopoeia can be used as a linguistic device in many types of writings including jokes. Do you remember the old Knock-Knock jokes, even the name of this type of joke is another example of onomatopoeia. Both of these poems use onomatopoeic representations of animal noises to entertain. There are many other examples of onomatopoeia found in kid's poetry, see if you can hear them next time you listen to a nursery rhyme. To use this website to search for examples of onomatopoeia scroll back to the top of the page click on a letter given on the right-hand search menu, if you click on 'A' it will take you to onomatopoeic words beginning with 'A'. Or, you can use the menu at the top of the page to link you to examples of onomatopoeia in letter ranges A-F, G-M, N-S, and T-Z. If you also want the definition of these onomatopoeic words then simply click on the word to be taken to its definition.